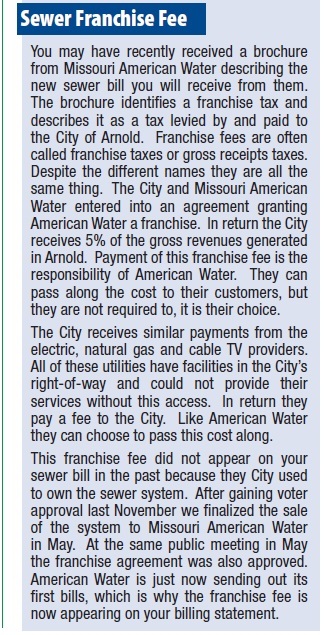 Note how they try to pass the blame to American Water: “It is their choice.” In reality, it was Arnold’s choice to assess the tax. Note also that city ordinances allow for the electric, gas, and cable taxes, but not the one for sewer services. We now know what Arnold wants to do with this clandestinely-acquired revenue. The September 10 council packet reveals a sewer lateral grant program on page 17 that would provide 100% of the costs for residents to fix their damaged laterals. That’s a good deal for some residents, and a bad deal for others. “People want services; they’re demanding services, but they’re going to have to pay for them,” he said. Of course, the people of Arnold don’t get to decide if they want to keep shoveling money at the hemorrhaging rec center and golf course, if they want to grossly overpay a third-rate city attorney year after year, or if they wanted the aforementioned boondoggles. But the city won’t help real people with real problems without a new tax. It doesn’t seem all that “conservative” to me to put that money away somewhere, and then raise taxes. Plus, can we really trust this council not to spend that money ASAP? Counts says in the article he wants to fix Arnold Park’s perennial flooding issues. That won’t be cheap. And I’m sure there are other pet projects festering in the minds of council members. The city employs the old selling point for sales taxes: all those out-of-towners will be paying it. City Administrator Bryan Richison estimates that 40% of the revenue from the tax will come from non-residents. That estimate probably presumes that those non-residents won’t take a look at Arnold’s near-10% tax rates (admittedly, some of that is from fire and ambulance districts, etc.) and decide to shop elsewhere. But I think they just might do that. If you are going to pass a tax, it seems like the property tax would be much more appropriate here. Who is going to benefit most from this spending? Property owners. But instead, the poor, people who rent, and people who don’t even live in Arnold will have to shoulder the burden for this spending. All because it is easier to get a sales tax passed by voters. Under Missouri’s Hancock amendment, voters have to approve the creation of a new tax or the increase of an existing tax. Could it be that this tax was approved long ago but not actually charged until now? Something like that happened in Pevely in 2013, where a 5% gross receipts tax had been approved previously, but only 1% was collected until the board raised it to the approved 5% level. No public vote was needed. (2) Six and nine-tenths (6.9) per cent of the gross receipts of such business derived from all users who are not residential customers. Sections (b) and (c) cover business organizations supplying gas or gas service and telephone service. But that’s it. Nothing in there about sewers. There is a legal difference between a tax and a fee, and the latter are not subject to the Hancock Amendment. But I think this clearly falls under the definition of a tax. There is a franchise fee provision in the ordinances, but it only applies to video service providers (aka cable companies). 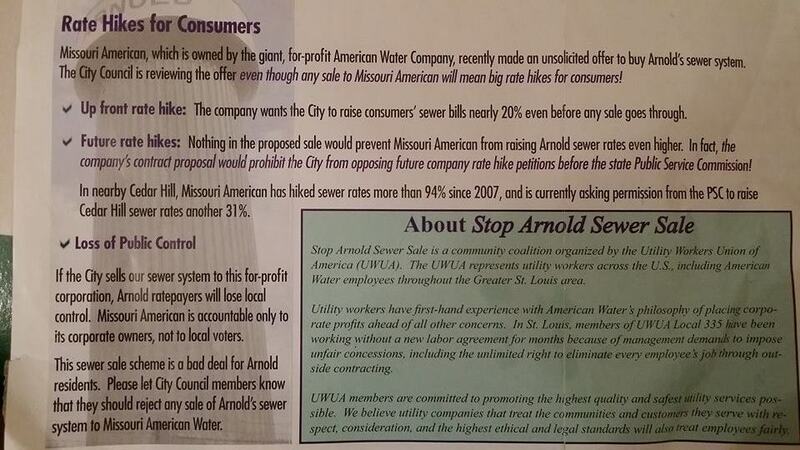 Did the ballot provision that approved the sale of the sewer system include tax language? No it did not (see page 8 here). Beyond the secrecy, it appears that this may also be an illegal tax. It is not authorized in city ordinances, and the public did not get a chance to vote on it. 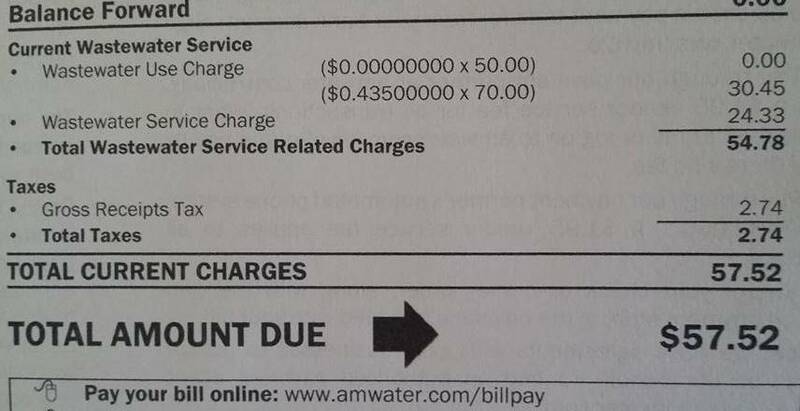 This should really be no different than the tax you pay on your phone or gas bill. Those are collected from the customer by the business and submitted to the city, and those are set out in the city ordinances. But the only way to challenge this tax is in court. Will anyone step up to take this on? Arnold is perhaps betting that nobody will. At its August 20 meeting, the city council will consider placing a 1/2 cent sales tax hike on the November ballot for capital improvements. This tax would allow for the elimination of the stormwater fee, which some believe is also illegal. If I’m not mistaken, there will be absolutely nothing else on the November 2015 ballot, so Arnold will have to spend a lot to pay for the holding of the election. Also, Arnold’s current sales tax rates (page 8) range from a base of 8.35% to 9.35% at Arnold Commons to 10.35% in the Ridgecrest TDD. Add 0.5% to these numbers if this tax is approved.